Experience a better shower with the control and flexibility of a Delta. hand shower. Great for showering yourself or your loved ones and pets, as well as for keeping your shower and tub clean. While other products may gather unsightly mineral build-up over time, Delta soft rubber Touch-Clean. spray holes allow any mineral residue to simply be wiped away for an instantly refreshed look with no need for soaking or the aid of chemical cleaners. The pause setting gives you ample space for shaving, lathering and other shower tasks, then easily restarts the water with the temperature where you left off. This spray setting helps you conserve water, so you can worry less about depleting your supply of hot water - and you help the environment too. 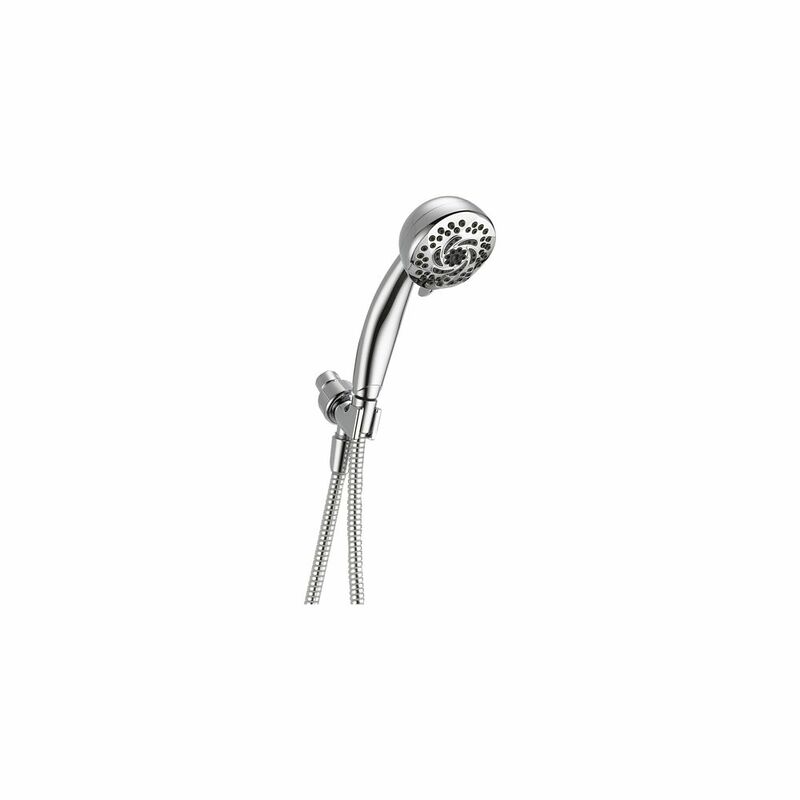 Enjoy an amazing shower from head to toe with this showerhead hand shower combo from Delta. Its 2-in-1 design makes it easy to rinse and clean every inch of your body. Measuring 9-inch D, 5.35-inch H, and 9.50-inch W, this showerhead offers gives you plenty of water and takes up little room. Shower Mount Hand Shower, Chrome Wash the day away with this multi-functional hand shower. We've got you covered from top to bottom, or bottom to top, giving you water anyway you need it, anywhere you need it. Innovative Pause feature allows you to conserve water while lathering up. Shower Mount Hand Shower, Chrome is rated 3.0 out of 5 by 2. Rated 1 out of 5 by BD from I brought this and totally hate it. There is little to now pressure coming out in any setting so... I brought this and totally hate it. There is little to now pressure coming out in any setting so you never feel clean and the handle sits in the hold, it doesn't snap in at all so you can't set the direction you want the spry to go. If you just bump the hose at all it will spin in the cradle and spray sideways.